As Thanksgiving is coming around the corner, it’s a good reason to make more dishes with pumpkin. Pumpkin is one of my most favourite veggies that’s highly nutritious and versatile. Some people argue that pumpkin is a fruit though. Whatever you like to classify pumpkin, you can make many savoury and sweet dishes with this amazing vegetable as you like. You can even carve a pumpkin at Halloween of course. For myself, eating is the first thing in my mind. 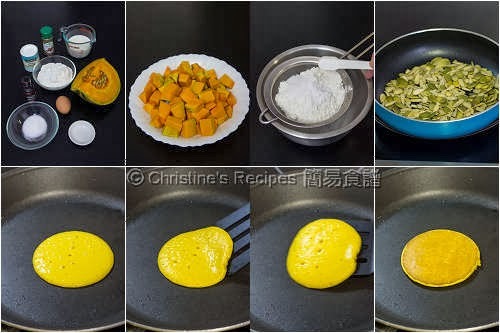 I made some pumpkin pancakes the other day for breakfast, along with a few slices of fruit and a cup of tea. It’s a good start for my day. The soft and delicate pancakes went really well with the crunchy nuts and flavoursome maple syrup. We love even golden brown colour on pancakes. I’d share the tip on how to do that below the recipe. Please share yours if you find any method works for you. Peel and deseed the pumpkin. Cut into cubes. Cook them with a microwave oven or steam them in a wok, covered, until softened. Use a large spoon to press through a sieve and make pumpkin puree. Set aside. Combine the cake flour, sugar, salt and baking powder together and sift through a sieve. Set aside. Use a large mixing bowl, combine the pumpkin puree, egg, vanilla extract, milk and mixed spices. Pour the pumpkin mixture into the flour mixture in three batches. Lightly fold and combine well. Don’t over stir the batter. 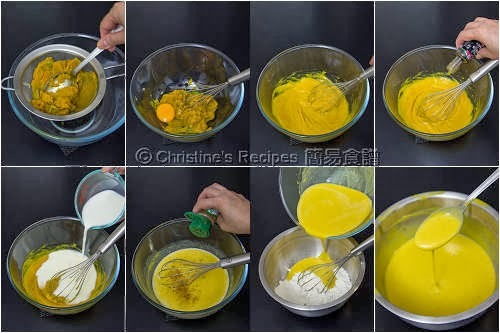 The batter shouldn’t be too thick, just thin enough to drip from a spoon as shown in the above picture. Cover and let it rest in room temperature for about 20 minutes. If you find the batter is too thick, you can add a little of milk to adjust the consistency. Heat a non-stick pan over medium-low heat. Spray or brush with a little oil or butter. Pour in about ¼ cup batter and cook until both sides are golden, about 3 minutes each side. Repeat this step with the remaining batter. 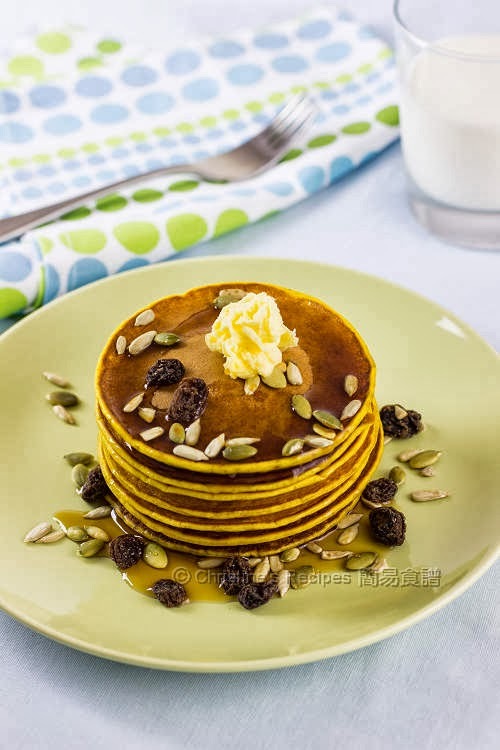 Serve with butter, pepitas and raisins on top, drizzled with maple syrup. The batter will become thicker after resting for a while. You can add some milk to adjust the consistency. You can make the batter a day ahead. Chill in fridge with cover. The mixed spices I used contains cinnamon, nutmeg and allspice, available from supermarkets. You can mix your own spices, or simply skip it if you haven’t got any. Don’t discard the pumpkin seeds. You can roast them as delicious snacks. 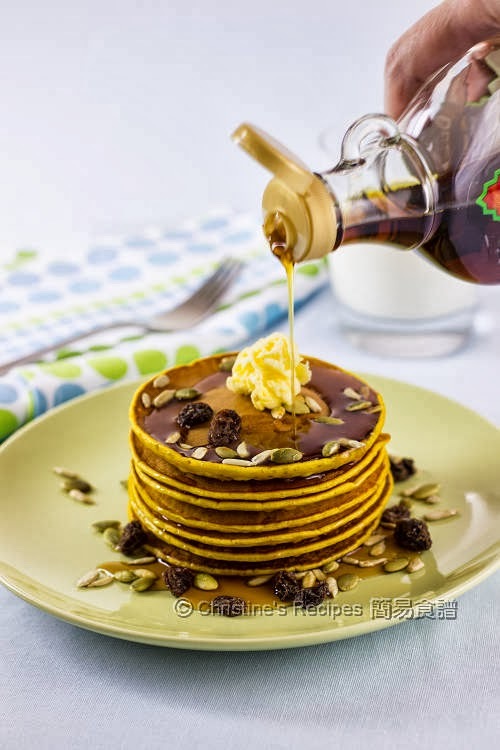 The trick of making pancakes with even golden brown colour is simple. It’s all about patience. Use less oil and cook on medium-low heat. The first pancake might not be perfect. But you’ll get a better looking pancake starting from the second one. 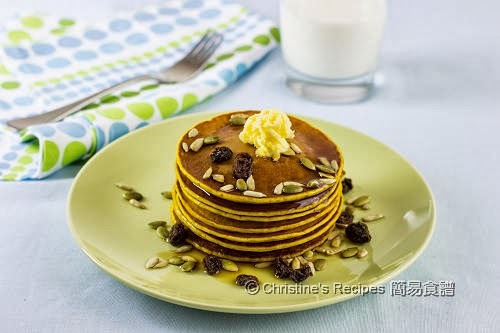 These pancakes are so perfectly even and delicious, Christine. I'd love to have these for breakfast too.....thanks for the tips!